Unhealthy fats are too often given undeserved praise as health foods! How can flax oil be an unhealthy fat? It contains an abundance of omega-3 essential fatty acids, doesn't it? Here's the problem: flax oil is THE most unstable edible oil. It goes rancid far more quickly than just about any fat you can name! Rancid oils contain a LOT of free radicals that damage the body and are a major cause of disease and accelerated aging. If you DO want to include flaxseed in your diet, get whole flaxseeds fromthe health store. Grind a small amount in a coffee grinder and eat it immediately. Did you know that once flaxseed is ground, within 24 hours it does not even qualify as animal feed? This is because the fatty acids are so unstable they go rancid that fast! Rancid fats in flax oil and ground flaxseed are unhealthy fats. You will not find this information readily available on the internet. Why? Because those selling flax oil dominate the search results! This is the kind of misinformation that drives my passion to create this website! I used to buy peanut, walnut and hazelnut oils for use in salads and cooking. Like flax oil, these nut oils are unhealthy fats because they are quite unstable and become rancid easily, though not as easily as flax oil. First, they contain FAR more omega-6 essential fatty acids than omega-3's. Most people consume a disproportionate amount of omega-6's. Research shows that too much omega-6 and not enough omega-3's is related to cancer risk. Secondly, cold pressed nut oils are VERY heat-sensitive - not good for cooking. Molecular changes from heating make these oils into toxic substances that are not good for us. 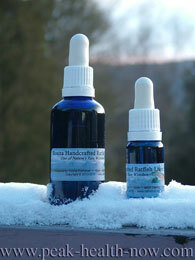 Third, you may be interested to know that the majority of 'cold pressed' oils ARE heated. Even the nut and seed oils you find in health stores have been refined and deodorized, which requires HEAT! The term 'cold pressed' technically refers to the nuts or seeds themselves not being exposed to the high temperatures used for conventional brands of oils. However, that doesn't mean that AFTER the oil is expressed from the nut or seed, no heat is applied! Plant sterols! Beta sitosterol, campesterol, sitostanol, and campestanol are compounds that are important for weight control, prostate health and hormonal health for both men and women. These beneficial ingredients are refined out of nut and seed oils to increase shelf life and make the taste more neutral. Similar, though slightly less, degradation through rancidity occurs in nut butters. when you buy almond, cashew, or other nut butters, you never know how long it's been since they were ground into a paste. Nut butters have all the same problems to a lesser degree than nut oils. If you love nut butters, the BEST, healthiest and tastiest solution is to grind your own from the freshest nuts you can find! 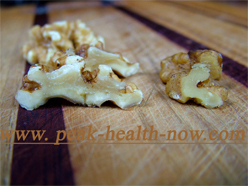 Take a close look at these walnuts... See how the ones on the left are bright, creamy white inside? That's what you want to look for when buying nuts. Avoid dull coloration like the ones on the right.